This document describes the OpenLM Roles and Permission Groups feature, and serves as a reference guide to system administrators who seek intricate grouping and permission granting over their OpenLM managed licensing control system. 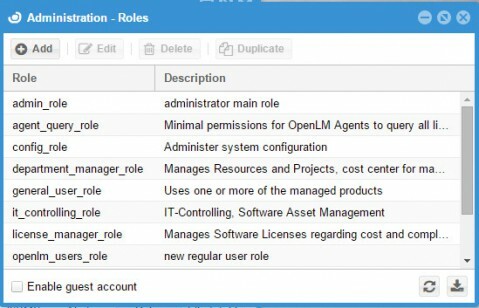 The OpenLM Server supports a role-based security feature that enables system administrators to implement customized access to OpenLM tools by setting access roles. 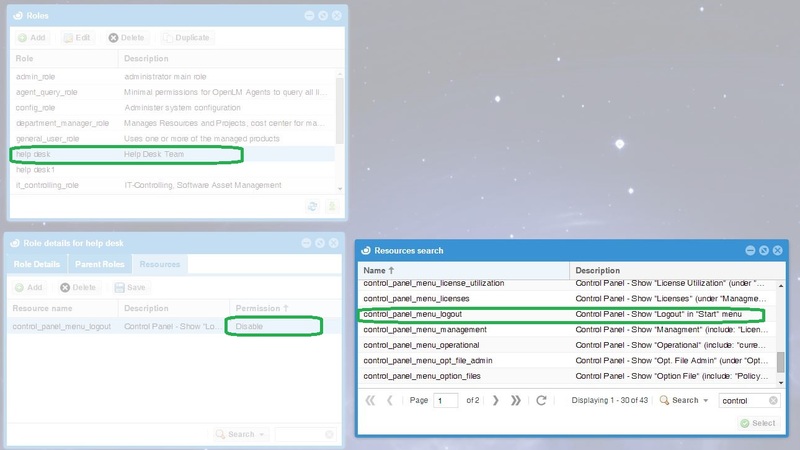 This feature facilitates the implementation of OpenLM tools for diverse groups; like help desk, system administrators, managers and developers. The role based security system secures nearly all the resources of the OpenLM system’s entities, such as listed servers, fields and action buttons. Allow: The resource is accessible for a user or a user group. Disable: The resource is visible but not accessible for a user or a user group. Deny: The resource is neither visible nor accessible to a user or a user group. A set of such Resource permissions is referred to as a role. Roles are attributed to certain groups of function holders in a company, each group having different accessibility options to OpenLM’s resources. Roles’ implementation may be set on, enabling the differentiation of users and groups according to permission levels, or turned off altogether, thus granting all users and user groups full accessibility to all the system’s resources. 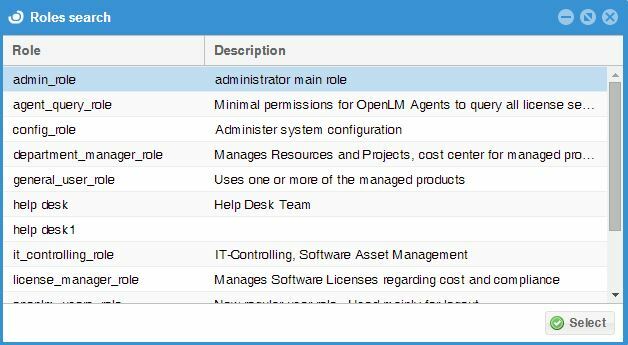 Handling of roles and permissions is easily done by system administrators on the EasyAdmin administrative interface of the OpenLM system. The intuitive EasyAdmin control panel incorporates all the options required to configure the roles and permission groups according to administration requirements. Permission groups possess an inheritance property. This property facilitates the application of similar permission schemes to different groups. By doing so, different groups may be easily created with only slight differences between their permission schemes. The characteristics of the roles and permissions feature have evolved over time, through constant feedback from OpenLM’s dependable customers, and are continuing to evolve according to common requests. For this reason OpenLM encourages its customers to send back their feedback and specific required features. 1. First, your organization’s SMTP server has to be configured. Simply open up the OpenLM User Interface –> Click Start –> Select Administration –> Click on Email/SMS –> Fill in your organization’s SMTP Sever details –> Send Test Email –> Save. 2. 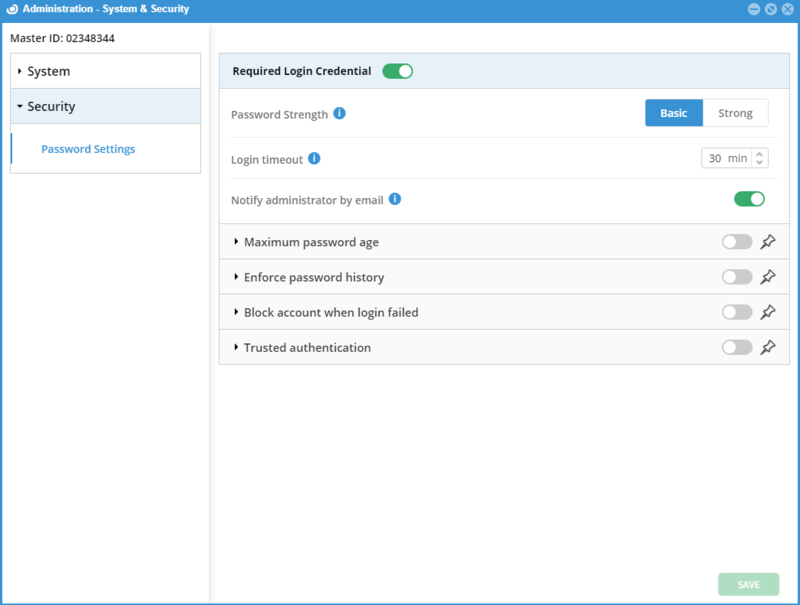 Roles need to be created using OpenLM Administrator privileges, so go to the OpenLM EasyAdmin interface and click Start –> Administration –> System & Security –> Security Tab –> Require Login Credentials –> Save. In the dialog promped, enter username and password for the admin superuser –> Next –> Enter verification code (Sent to your inbox) –> click Next –> Choose a strong password and repeat it –> Click Confirm. 3. 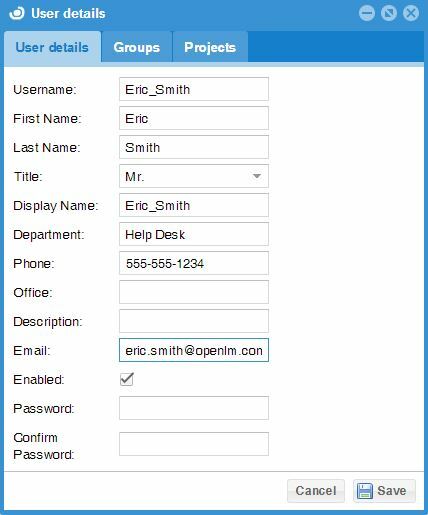 Open the EasyAdmin web application, and log in with the Administrator’s name and password. 4. Click the Start button on the EasyAdmin control panel. Select Administration → Roles tab. The Administration-Roles window appears, with some predefined default roles and their description. 5. Click the Add icon, to add a role. The Role Details dialog window appears. 6. Type in the role name and description (e.g. “HelpDesk” and “Help Desk Team” as they appear respectively in the image above). Click Save. Note that the new role name would be saved in lower-case format (i.e. “helpdesk”). 1. In the Roles window, Select the required role, e.g. : “helpdesk”. Click the “Edit” icon. The “Role Details for helpdesk” window appears (Similar to the “Role Details” dialog window depicted above). Note that the default predefined roles may not be edited. 2. Select the Resources tab, and click the Add button. The “Resources Search” dialog box appears. Note that each line in this table contains a Resource name and description, easing the linkage between a registry in the table and its actual function in the OpenLM system. 3. Select a resource (e.g. the add_project as marked above), and click the Select button. The “Role Details” window’s Resources tab now appears with the newly attached “add_project” resource. 4. Select the Resources tab and click on any line while under the Permission heading. The drop-down functionality is engaged and the user may now select a permission attribute for a resource per user. 1. 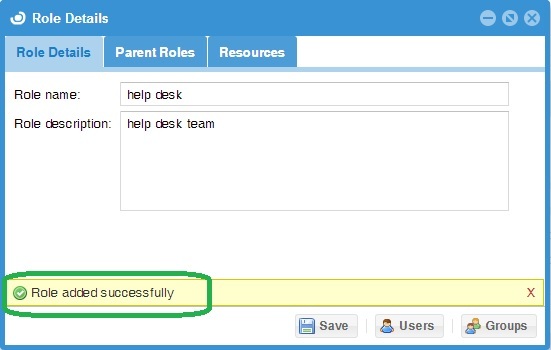 In the “Role Details for helpdesk” dialog window, select the “Parent Roles” tab and click the Add icon. The Roles search dialog window appears. 2. 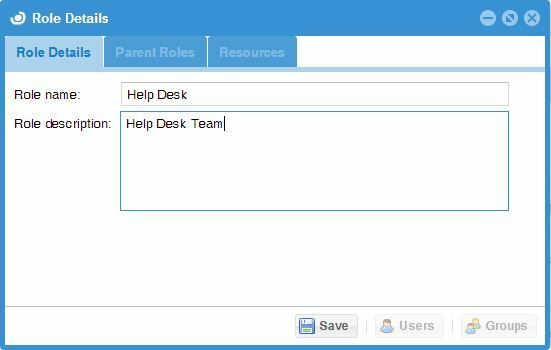 Select the role that would serve as the parent of the newly created “helpdesk” role, e.g. “admin_role” in the image above, and click the Select button. Note that the “admin_role” is the default basic role, and is always apparent for serving as a parent role. 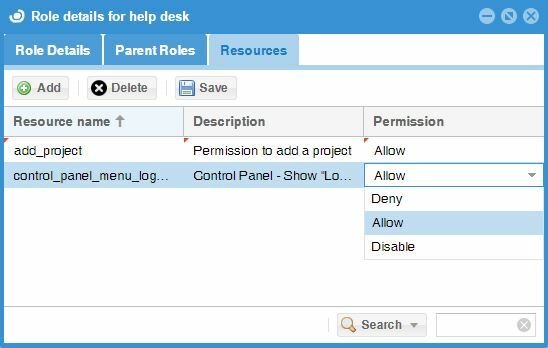 The new “helpdesk” role now possesses all the permission attributes of the parent “admin_role”. In order to assign roles to users, we should first make sure such users exist in the OpenLM database. The list of users is shown in the EasyAdmin ‘Start’ → “Users & Permissions” → “Users” tab. 2. Through monitoring of license usage. 5. Manually created, as described below. Assign a login password to the user. 1. Follow this path, EasyAdmin Start→ Users & Groups →Users tab. The Users window appears. 2. Click the Add User button. The User details form appears. Fill in the appropriate information items, check the Enabled box and click Save as depicted below. a. Follow this path: EasyAdmin Start→ Users & Groups → Groups. The Groups window appears. b. Select a group from the Group window (e.g. “GroupName”), and click the Members icon in order to view the members of the selected group. The Users in Group Name window appears. c. Click the Add icon, in order to add further users to Group Name’s list of users. After establishing a new role of permissions and introducing a new user or group of users, it is now possible to attach this role to the users, in order to assign the role’s permission set to these users. 1. Follow this path: EasyAdmin Start→ Administration → Roles. 2. Select the new role (e.g. “helpdesk”), The Role details for help desk” dialog window appears. 3. Click the Users or Groups buttons on the bottom of the window. The appropriate window (i.e. the Users in helpdesk or Groups in help desk) appears. 4. Click the Add icon. The appropriate window (User search or Groups) appears. Select the required instance of user or group, and click the Select icon. 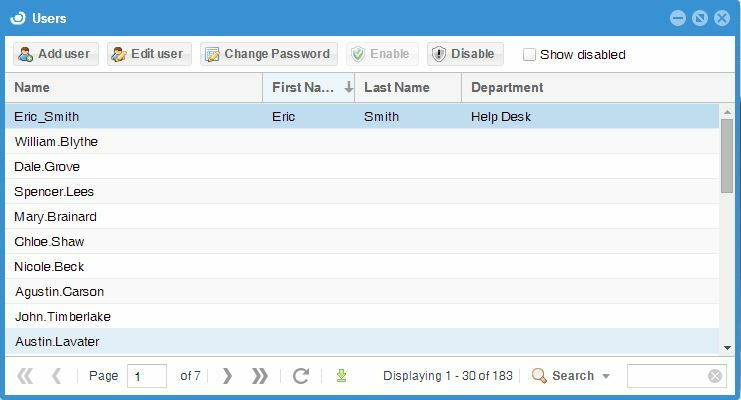 The added user or Group instance has been added to the role, and may be seen there in the Users in help desk or Groups in help desk window. 1. Follow this path: EasyAdmin Start –> Users and Groups –> Workstations. In this example – this would be the affected Resource. 2. Follow this path: EasyAdmin Start –> Administration –> “Roles” tab. 3. Select a specific role, e.g. “helpdesk”. Click the Edit button. The Role details for helpdesk dialog window appears. 4. Select the Resources tab and click the Add icon. 6. Stand and click on the Permission attribute of that Resource. a drop-down list appears. Click the drop down list, and select the required permission attribute value, e.g. : Disable. 7. Click the Save icon, close and reopen the OpenLM EasyAdmin UI. 8. Click the Start button on the EasyAdmin control panel. Select the Users & Groups tab. Notice that Workstation is no longer visible. It has been removed from the admin_role view. If the permission of a Resource entry which name starts with the word “server_*” is disabled or denied, the respective user groups would become unable to view items on that server. Moreover, that server would become omitted from the OpenLM Agent’s “License usage information” window. 1. Uncheck, and then recheck the Require Login Credentials checkbox. Follow the Creating a new role section above. 2. Assign resources to the new role: After you save the new role, the Resources tab will become enabled. Navigate to that tab. Note that it is assigned with one default resource. Now you need to add all resources that have this name pattern “server_servername” e.g. server_srv1 (where srv1 is the name of the server that you will grant access to). In order to do so, Follow the description in section Adding resources to a role above. 3. Assign the new role to the admin user: In order to do so, Follow the description in section Assigning roles to a user or group of users above. Using the permissions tool, it is possible to grant resource permissions to single users independently. Also, as stated above, permissions may be inherited from parent roles. If one method grants permission and the other denies is, a mismatch condition may be present. In this case – an arbitration procedure is executed; The closest entity to a single user, i.e. a permission attribute granted to an individual user, or to the “youngest child” of an inherited attribute is the most “powerful”. If two contradicting attributes of the same strength are applied: an unknown condition may occur. Admin role is parent to two roles: Role1 and Role2. Admin denies permission to a resource. Role1 does not explicitly refer to that resource, hence – it denies it implicitly. Role2 explicitly allows the resource permission. If User is attached to any one single role, its permission attributes will be the same as that of the role. If User is attached to roles Admin and Role1 the permission will be denied. If User is attached to Role1 & Role2, the permission would be allowed, since Role2 is the “youngest child” to infer to that resource. If User is attached to roles Admin and Role2, an unknown condition occurs. A ‘Guest’ user role may also be defined. This user will not require a password in order to login, and will normally be granted limited permissions. Check the “Enable guest account” box. Assign resources to the “Guest_role” role. On the next EasyAdmin login the user will be handed the option to log in as a guest, without the need to type in a password.